Who can resist a cupcake? They are so darn cute and make delightful little hand held treats. Cupcakes are so prevalent these days throughout the foodie world and Colorado blogger Elana Amsterdam has presented the gluten-free community with a lovely Spring gift with her new cookbook "Gluten-Free Cupcakes: 50 Irresistible Recipes Made with Almond and Coconut Flour" (Berkeley, CA: Celestial Arts, 2011). We picked up the ingredients and also decided to top these delicate cupcakes with Elana's Strawberry Meringue Frosting (p. 97). 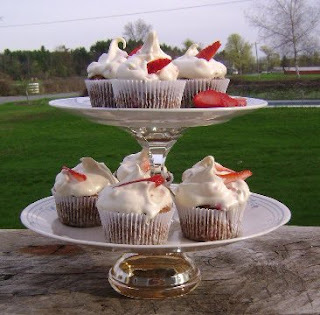 These cupcakes were delectable and even better the next day after the chopped strawberries mixed into the cupcake batter had moistened up the cakes with their juices. Coconut flour provides the base for the cake mixture and has a nice fiber and nutrition boost as well. All of the recipes in Elana's book are chock full of healthy ingredients, so one can feel good about cooking up these sweet treats and serving them to your family. The author does a great job of describing the various ingredients that she uses in a beginning chapter that is really useful. Cooks that are unfamiliar with what they are, where to buy them and how they perform in the baking process (cooks like me!) will refer back to this section many times over. I am glad that my kid picked the Strawberry Cupcake recipe, because not only was it scrumptious, but it was one of the recipes that didn't call for almond flour. The only almond flour I have found in my area for sale is at a local health food store for $13 for a one-pound bag, and that's just too expensive for me. I see that one can halve this price online, but I wasn't ready to plunk down double digits for a bag of flour. The book contains a great selection of other interesting flavor combinations to try out (Pecan Pie Cupcakes, Pina Colada Cupcakes, White Chocolate Cherry Cupcakes) as well as some gluten-free recreations of some nostalgic delights, like the Cream-Filled Chocolate Cupcakes which are dead ringers for the Hostess chocolate cupcakes. There are also a few toothsome savory muffin recipes at the back of the book. Kudos also to Annabelle Breakey for the great color cupcake photographs throughout the book that make all of these recipes seem so irresistible. I enjoyed perusing and test driving this sweet treat of a cookbook and recommend it to other home bakers. ***As an aside, this book review also gave me the perfect chance to make my own cupcake stand made from vintage plates and candlesticks. I certainly have more than a few orphaned pieces of china in my shelves and will now be keeping an eye out at garage sales and thrift shops for more perfect cupcake stand components. With inspiration from my Greek blogger buddy Johanna, of Food Junkie, Not Junk Food, I whipped this up craft project up in a few short minutes on one of the few breaks in the Spring precipitation we've been enjoying this past month. I used a clear all-purpose epoxy to join my pieces together and want to remind those of you who may want to try this cupcake stand project out yourselves to make sure to do so outside or in a very well-ventilated area. Solvent fumes are very hazardous to your health and I want you around to let me know how your cupcakes and cupcake stands turn out! Yum, those are some tempting cupcakes. I even want to try that frosting, though I bet I'd get the same complaints from "the others" ;). And I NEED a tiered stand like that...must check out that book! 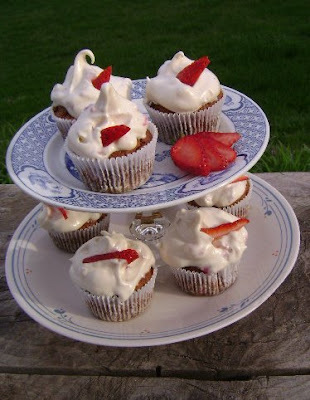 My mouth is hanging open--first, because those cupcakes looks so yummy and second at the price of almond flour. Hi dear Rachel! Long time no talk. :-( Gorgeous job on Elana's cupcakes! And BRILLIANT on the cake stand!! I've got to do that! I am so glad you found those cake stands so inspiring! I haven't gotten round to making one yet, but thanks for the tip about the fumes. I hadn't thought about it. Great recipe too and so seasonal.